I would recommend superior auto clinic to anyone! Took amazing care of my car and they really went above and beyond. Can't say enough how great they are. Thank you Amber for the great review! We are glad you were happy with our service and the repair of your Honda. The repair was a good challenge and that's what keeps us sharp. You now have a place you can rely on! The ownership may have changed but the quality of service remains the same. I can heartily recommend Superior Auto to all. What consumers still want is honesty and fairness. Bill will continue to provide that level of service, I believe. And I want to thank Gary for the many years he spent building this business. Enjoy your retirement! I appreciate the kind words Ron! It was a pleasure meeting you and thank you for giving me the chance to continue to provide you with with quality service and an honest and friendly shop. I look forward to helping you for years to come! I recently needed to find a new shop and this one fits all my needs in Chico. I couldn't have asked for more, a GREAT CUSTOMER EXPERIENCE overall!! I will be back!! Thank you Ray! We are very happy to hear how pleased you were on your first visit to our shop. We are here for all of your automotive needs. From wiper blades and oil changes to engines and transmissions and everything in between! We look forward to seeing you again. 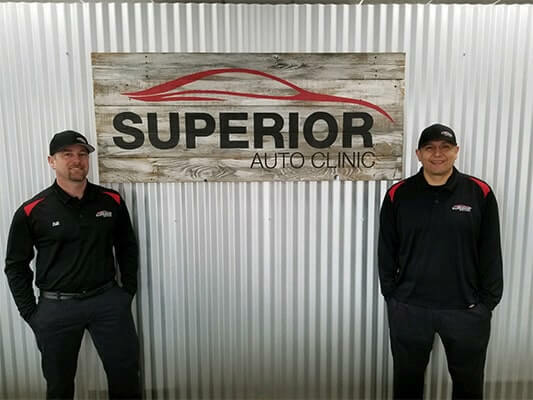 Even though the owners of Superior Auto Clinic have changed throughout the years, one thing remains the same – we have been the lead in Chico auto repair since 1953. We are a full-service auto repair facility which specializes in SUPERIOR customer service and are committed to creating a great customer experience with every visit. As a local family run shop, we deliver big results. All our technicians are ASE certified, including one master ASE certified tech. We are an AAA approved repair shop and a part of the PRONTO auto service network. Whether you come in for an oil change, SMOG testing, or a complete engine overhaul, we will always deliver high quality work!